LIFE is a step closer to getting complicated for Mike Finn (pictured). The 32-year-old from Eastleigh has earned himself a £1,000 Q School place by winning the Cuestars South of England Championship Tour. 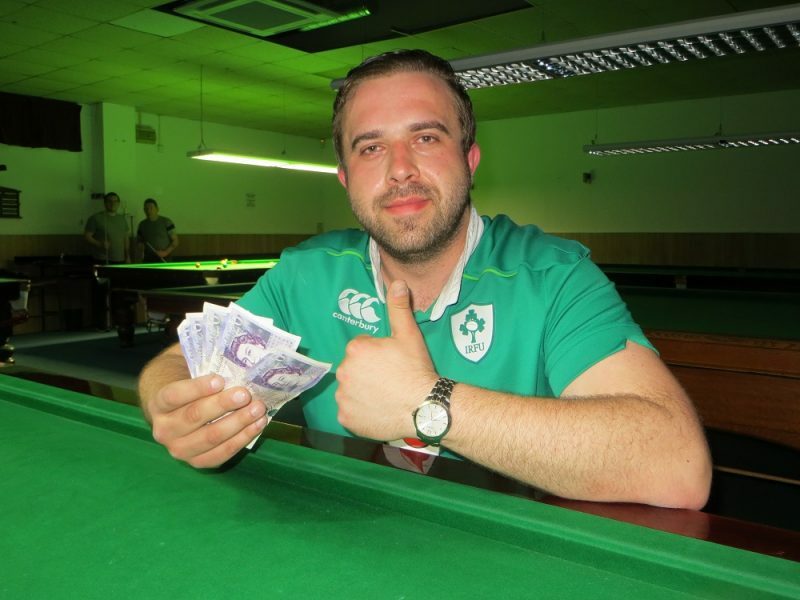 He defeated Paul Bunyard 3-2 in the final of the eighth and last leg at Greenbaize Snooker Club, Bournemouth, to secure top spot in the rankings. “I’ve not had a buzzing sensation like that on a snooker table for a long time,” admitted Finn. He now travels to Burton-on-Trent on May 14 for three tournaments where the 12 semi-finalists will gain two-year tickets for the professional circuit. Challenge Tour places, another route to the World Snooker Tour, will be offered to the next 64 players to win the most frames. Reflecting on the chances of joining his old social club’s teammate Billy Castle, who won the Championship Tour last season and qualified through Q School, Finn said: “If I can get a couple of wins under my belt, there’s no reason why I can’t. Finn went into the last event needing to win the final if rankings leader Ryan Mears (Aldershot) qualified from the group stages. When the title rivals met in the last-four, Finn wrapped up a 3-0 victory in 42 minutes. And after just 16 minutes of play in the final, he led 2-0. However, Bunyard, also from Aldershot, fought back and took the next two frames on the green and yellow respectively. Fears that Finn would now press his infamous self-destruct button were dispelled when he pounced on a half chance in the decider and cleared the table with a 91. The former England international, who had forked out £1,000 of his own money to enter Q School and will now receive a refund, insists his temperament has improved. “I’ve managed to get it a little bit under control recently,” he said. “Mike Finn of old would probably have chucked the towel in. And that’s no good. “I played probably the best I have done this year. I made it hard work by switching off in the final after going 2-0 up but I always felt pretty comfortable. And he revealed he learnt a valuable lesson during last month’s Gibraltar Open. “I had a couple of close matches and I beat European champion Harvey Chandler in the second round,” he explained. And that’s because Finn will wed girlfriend Roxanna, the mother of their ten-month-old daughter Enya-Rose, on the Queen Elizabeth cruise ship, where they met, in December. The 24-strong field for the event sponsored by Snooker Hub, a website dedicated to the amateur game, returned 28 breaks of 50 or more. Christian Chislett (Basingstoke) kicked things off with an 81 against Mike Trigg (East Wellow) in the first match to finish. Then, Herman Desmier (Wimborne), who only entered because he wanted to see some of the whizzkid juniors in action, was not disappointed. The Masters Tour player was on the receiving end of an 81 by 16-year-old Connor Benzey (Eastleigh) and he then picked the balls out for 15-year-old home player Bradley Cowdroy’s highest competitive break of 93. But that was eclipsed by Bunyard’s 98 in the first frame of his 3-0 semi-final victory over Chislett. Callum Browne (Trowbridge), who has been selected for the England universities side for the Home Internationals, lost 3-1 to Finn in his first quarter-final on the Championship Tour. To visit Snooker Hub, go to https://snookerhub.co.uk. Paul Bunyard: 98, 67, 67, 66, 62. Bradley Cowdroy: 93, 73, 67, 51. Mike Finn: 91, 71, 70, 69, 67, 67, 63, 62, 55, 50. GROUP A: 1st, Mike Finn (Churchills, Eastleigh); 2nd, Christian Chislett (Selsey RBL, Chichester); 3rd, James Cullen (Woking SC); 4th, Arron Smith (Selsey RBL, Chichester); 5th, George Heatley (Woking SC); 6th, Mike Trigg (Chandlers Ford SC). GROUP B: 1st, Ryan Mears (Sovereign, Farnborough); 2nd, Neil Craycraft (Jesters, Swindon); 3rd, Steven Nevett (St James Institute, Bournemouth); 4th, Anthony Rice (Salisbury SC); 5th, Elliott Weston (Top Spot, Havant); 6th, Martin Wallace (Crowthorne RBL). GROUP C: 1st, Paul Bunyard (Woking SC); 2nd, Bradley Cowdroy (Greenbaize, Bournemouth); joint 3rd, Marc Russell (Chandlers Ford Central Club), Connor Benzey (Chandlers Ford SC), David Rice (David Rice); 6th, Herman Desmier (Bournemouth & District Constitutional Club). GROUP D: 1st, Olly Gibbs (Chandlers Ford SC); 2nd, Callum Browne (Player’s, Westbury); 3rd, Steven Hughes (Chandlers Ford SC); 4th, Jamie Wilson (Waterlooville Sports Bar); 5th, Ryan Hughes (Chandlers Ford SC); 6th, Johnathan Reeves (Greenbaize, Bournemouth). QUARTER-FINALS (24 points): Finn 3-1 Browne, Mears 3-2 Cowdroy, Bunyard 3-1 Craycraft, Chislett 3-2 Gibbs. SEMI-FINALS (£30, 30 points): Finn 3-0 Mears, Bunyard 3-0 Chislett. FINAL (£120/£60, 50/36 points): Finn 3-2 Bunyard.